Posted by Jon in Review, Sideshow with 4 comments. I’m going through a bit of an apprehensive period towards 1/6 scale figures. There aren’t a whole lot of them out there that I feel like I absolutely must have. This is probably a good problem to because I would hate to be the guy that feels the need to order every new Hot Toys Star Wars reveal. Of course the flooded market of Star Wars figures has also helped keep me away from most sixth-scale stuff, thankfully. Sideshow’s in house 1/6 work is not usually my cup of tea. The last figure I purchased that they made was the 2006 X-Files Alex Crycek, so it has easily been ten years now since my last Sideshow product. Obviously, they have come a long way since then, but as my purchase history states nothing ever screamed “must have” to me. So why Deadpool? My thinking was “I love that costume they made up for the movie, that would be a Hot Toys figure I would actually purchase!” Unfortunately, if history is any type of indicator, the FOX movies get little to no merchandise tie-ins. We’ve gotten a few Wolverines and that was pretty much it. I expect about the same for Deadpool (of course now that I’ve actually purchased this, a movie figure will be made so that the universe can spite me). I don’t know how the movie is going to turn out. There is a very good chance it could be a complete flop. It’s really hard to read from fan reaction to the trailer releases. I love that Ryan Reynolds and his team had the passion to even make this thing a reality, but does he have the drawing power? There are a lot of question marks around how the Deadpool movie will be received. If nothing else it really feels like the team behind it loves the source material. So the look is there, my only hope is that the end product is at least entertaining. But I did not this time. It started to grow on me. Sideshow also made quite a few improvements from the early prototype stage, most notably better matching the red tone of the head to the costume. I ended up accepting the look of the figure, and let the preorder go through. He includes a great amount of accessories, and this doesn’t even account for all the pouches. When I pulled him out of the box pouches were just falling off everywhere because they clip on and came loose in transit. This sounds like a bad thing but it really isn’t. Every pouch is removable so you have the freedom to give Deadpool as many or as few of them as you please. His costume has a lot going on. There are a ton of belts, straps, armor pieces, etc. The figure is probably a dream for parts farmers. 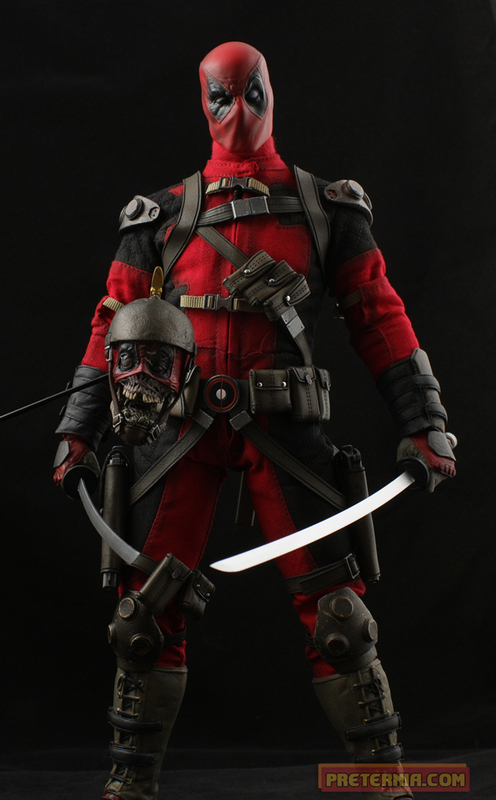 Headpool is an appropriate exclusive accessory. It really isn’t needed but they did a nice job with it. The detail, paint, and sculpt of the head is gorgeous. 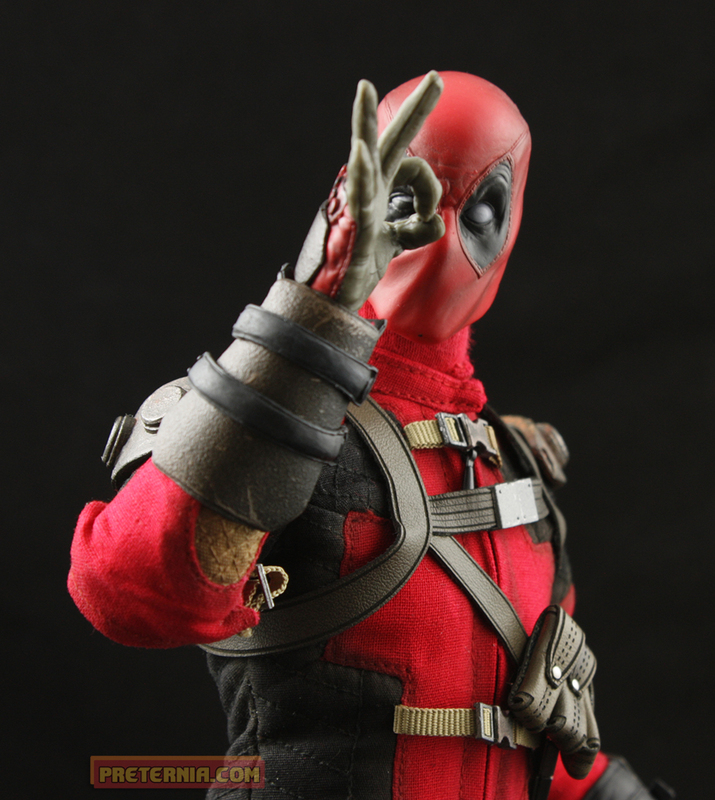 It can be attached to Deadpool’s display stand via an additional wire that plugs into the back of it. It’s a cool and simple inclusion, but I wouldn’t be upset if I missed out on it. Hell, it may be worth skipping the exclusive to avoid Sideshow’s nutty shipping prices … I think I paid like $24 to ship him? This figure did not cost nearly that much to ship! The accessory that disappointed me the most was the word bubbles. 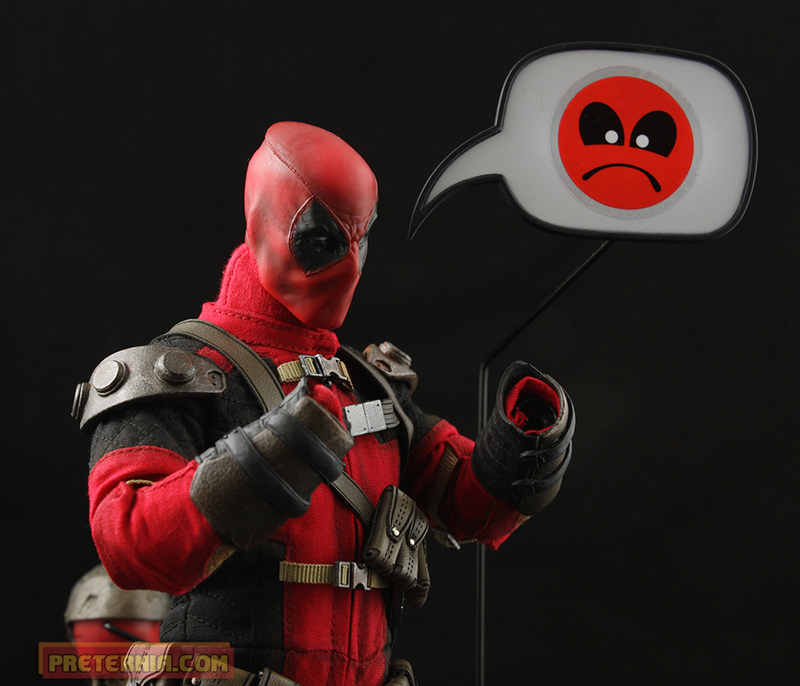 You have two plastic word bubble parts that plug into his base, similar to Headpool. Where this falls apart is that the words are included on a sticker sheet that sternly warns you to “Use minimal pressure when applying stickers so that they can be removed.” As soon as I began handling the stickers they ended up with finger prints behind them, and the sides started to dent when trying to remove them from both the sheet and word bubbles. This feature doesn’t have much longevity to it unless you plan to leave one word bubble the same forever. Otherwise these stickers just aren’t going to last. The word bubbles just weren’t my thing so all of that nonsense will be stored in the box, forever. Deadpool’s tailoring is really well done. I wish they maybe found a way to make him a little thinner around the waist area. Although, I’m not sure if that is due to the costume or the body Sideshow uses? Either way, it’s a minor gripe. Sideshow really did pull through with some amazing costume work here. The head, being sculpted, still matches very well with the cloth uniform. I also haven’t run into any loose strings or tears on the costume while messing around with him. Overall this figure is an amazing effort from Sideshow. The costume, sculpt, presentation, and giant amount of accessories really make him a respectable comic-based 1/6 scale figure. We get so many (maybe too many?) movie based figures in this scale, so not only is it nice to see something different but also something done so well. 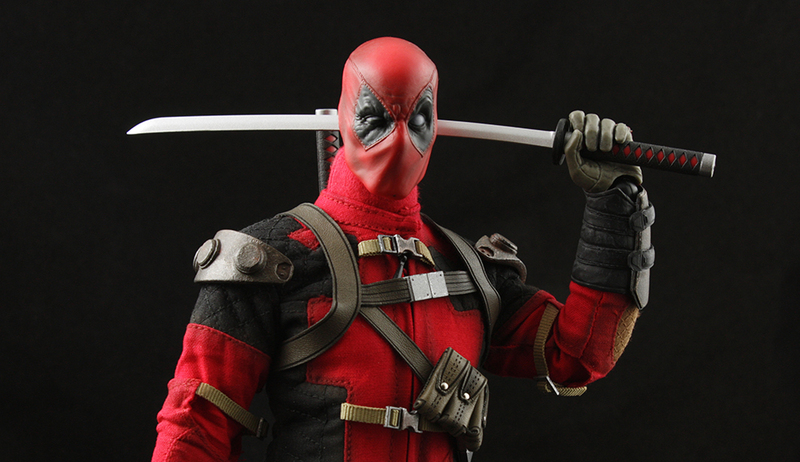 Deadpool will run you around $200 – $220 and is currently available at Amazon if you want to avoid Sideshow. He’s well worth it if you are into 1/6 scale figures. I don’t even have that many, but this one will have a predominant spot in my display. 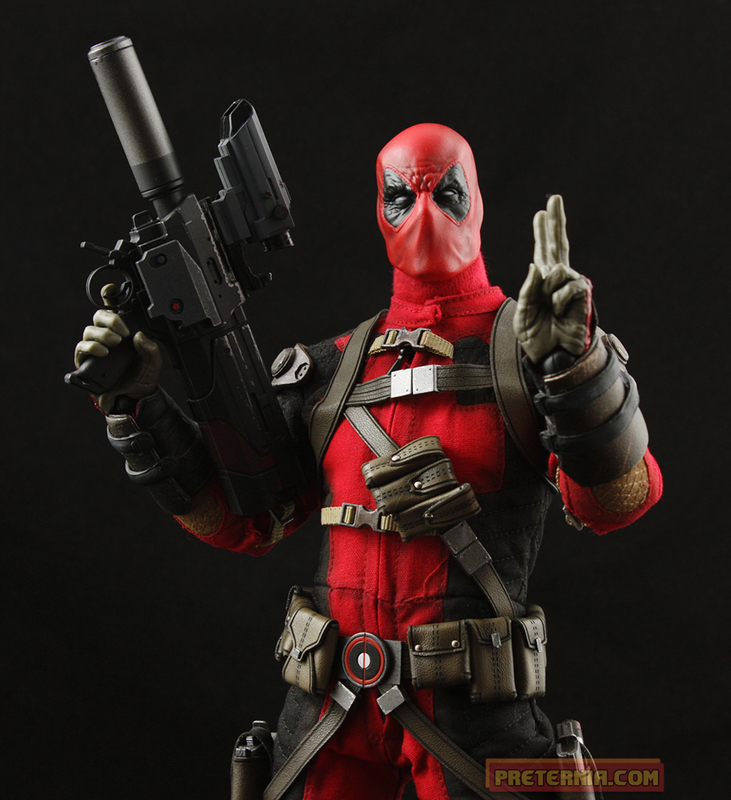 I totally pre-ordered Deadpool with the exclusive Headpool but I was so disappointed in their Snake Plissken (which I re-sold at below cost within a few weeks of owning him), that I totally cancelled. Good timing anyway because there is no way in the world I would have ended up having the money for Deadpool regardless. He does look pretty boss, though. Until Hasbro do another ML Deadpool (surely at some point next year), I will make do with the (still awesome) Toy Biz Marvel Legends Deadpool. Happy to live the 1/6th lifestyle vicariously through Preternia. I’ve heard the Plissken was absolutely terrible. 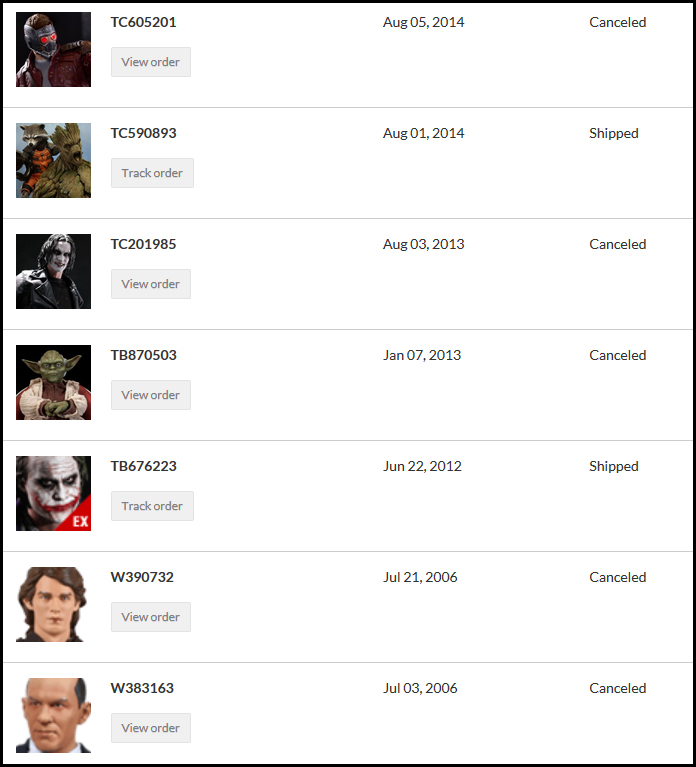 Really glad I just had no inclination to own that character. 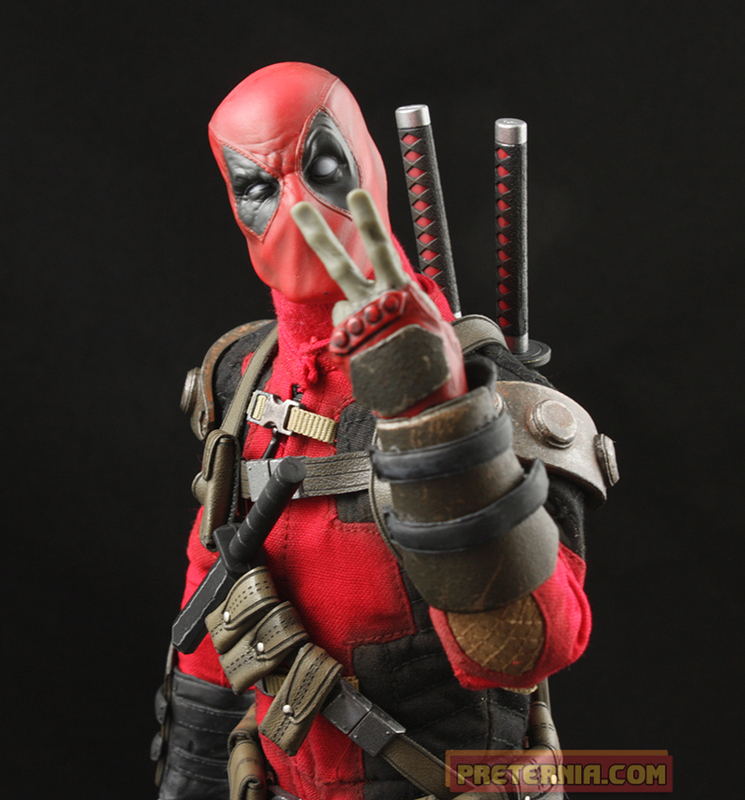 There will totally be a new Deadpool in the next ML Legends wave, so yeah save yourself $200. It’s a solid plan Wolf!